Composed by Stephen Weber. Contemporary Classical, Modern, Repertoire. Score. 42 pages. Published by Published by Dr. Stephen Weber (S0.223453). 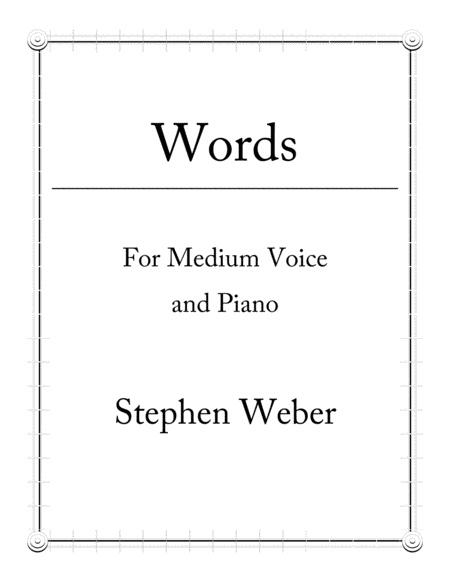 Words: Eight Songs for Medium Voice and Piano, is a most unusual and amusing set of pieces. The titles of each describe the use of language and text for the musical setting. They make excellent vocal teaching pieces as well as concert selections. In total, the eight songs are 17 minutes, though they can extracted and performed separately or in groups. They are equally challenging for the vocalist and pianist, and utilize a variety of compositional techniques, styles, and vocabularies. 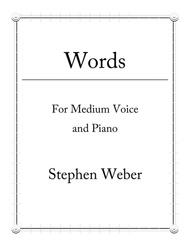 Dr. Weber is a member of ASCAP and has his own YouTube channel, at which you can hear many of his compositions or performances of his works here in the U.S., in Europe, and in Asia. He currently serves as Professor of Music and Chair of the Division of Arts and Humanities at the University of Science and Arts of Oklahoma.